All staff photos published in the Record-Eagle print edition during the week of October 25-31, 2009. Note: Some photos may not be available until late afternoon on the day published. Photos published on Saturday and Sunday may not be available until Monday. 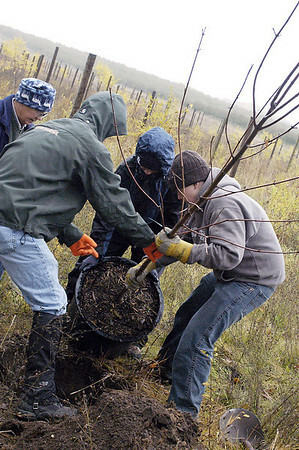 Patty Rudolph, a volunteer with the Old Mission Historical Society, along with Boy Scouts from Troop 31, Peter Melichar, Sean Brown and Chris Doerr, plant a young maple tree along Center Road on Old Mission Peninsula Saturday.